* Replace Poly Liner w/ Organic Cotton Liner? Bought two and back for more! After 2+ years of daily use our organic beanbag cover still looks practically new! No issues at all, cleans up nicely and we are ready to get a refill. We see many years of use ahead. I hesitated initially at the cost when purchased but it has been so worth it. Who can live without a great beanbag?! I purchased 3 of these in Navy via Amazon on 1/1/2017. They have been pretty flat for quite a while, so didn't even last 2 years. I am amazed at the people that say they don't have to fill it for 7 years! I am giving them 3 stars because they have not torn, but I am annoyed that I am going to have to spend a lot of money on filler after spending $500 less than 2 years ago. Really nice bean bag. We have 8 dogs, 8 cats, and 4 children, and these bean bags have held up well. We ordered 2 bean bags, and both have been urinated on by dogs. Even with the organic liners instead of the microfiber ones, they were not terrible to wash (in the bathtub). We will try the microfiber liner on our next one, though! I misunderstood my pending order due to having an initialized bean bag. Jade was so quick to call and even called again to ensure my address was correct for fear of missing my daughters birthday. She was wonderful!!! And yes, my organic liner and bag with initials is so well made and stunning to look at!! Thank you Jade. This bean bag is great! We love this bean bag chair! So far, the quality is similar to a chair I purchased twenty years ago. I will definitely recommend this to everyone. I was happy to find an option for organic covers and purchased two bean bag chairs for my kids’ room. My kids absolutely love them for lounging, sitting, playing, even napping! The size is also large and comfortable enough for adults. We bought this organic cotton bean bag last year. We adopted a young child from foster care who was beginning to show signs of sensory issues and needed a place to crash. We didn't want to expose him to any unnecessary cheimcals so we bought this bean bag because it was organic and because of the length of the warranty. It has been abused and the cover is still in perfect condition. We do have to get a refill, but considering the crashing that has been done on this thing, it's not surprising. Our son loves this bean bag and it's comfortable for us to sit in during play or story time as well. Meant to write to tell you how much Tye LOVES his gray cover! He is on it right now! Thanks for the easy exchange. You're a pleasure to work with. We have 3 active kids who needed additional seating in their playroom for guests. The covers wash great and my kids sit on them every day! Ours needed to be refilled about 3 months after purchasing and I am finally getting around to it. Even in a half filled state, the kids still love them and sit on them every day. Bought the 37" chair as gift for an 8 year old. She loved it. Very comfy. Big enough for an adult. Appreciate the organic cotton. Would have liked a bit more filling. i gave it to my grandson who is 8 today and he said he loves it! Had a hiccup in shipping but that was FedEx's fault - Ahh customer service took care of us with status and getting delivery done on time for his birthday. My Favorite Chair! And it is Organic Cotton! After a long search...I found you! Thanks for providing a great product. I love my bean bag chair-the fabric i sturdy and feels good. Very durable-the chair is used every day. Washes well and looks good. My friends love sitting in it when they come over. Customer service is wonderful and shipping is quick. i am planning to order another one, plus a refill for the one I have. We have had our organic cotton bean bag for nearly 3 years. Both our kids regularly jump on it, cuddle in it, hide under it during hide and seek, and nap on it. We love the color and the quality. Also, with preschoolers in the house and their unpredictable messes, we have found the removable, washable cover to be another favorite feature. The kids have been sharing one bean bag, and I am just now ordering a new one so that they can each have their own. The kids (and dogs) love them! I purchased 3 of the 37" organic bean bags in Dec. 2013. The kids have used them almost daily since then. I love them because they are organic and eco-friendly and the kids love them because they are so comfortable. They use them when they are watching tv, reading and even sleeping! I'm just about ready to purchase a 4th bean bag so our youngest child will have her own too! We bought these bean bags last year, and they are still a big hit with my kids and my cats--me too! They are well made and comfortable and don't seem like "transient" decorative furniture. I think they will be around for a long time to come. I rarely write reviews but want to praise both the product and the service. I messed up my order (my own fault); the company was so pleasant and helpful in resolving my mistake. I'm thrilled with the bean bag. Got the 37" in the lime green for my little girls -- perfect for snuggling up and reading a book alone or in a pile of 3. Quality is excellent. It's exactly what I was looking for. Wonderful purchase. Worth the price. About 3 years ago I purchased a quality organic bean bag for my granddaughter (who had leukemia ... and now is better!). This durable and safe product has been perfect. Now baby sister wants 'her own' and I am happy to buy her one too. Thank you Ahh, the only safe and sound bean bag company. Loved them, been 6 years - gotten flat from kids getting bigger! Fabulous. I have been searching for a cotton beanbag chair and found this! The size, texture, comfort-all great. Navy, organic cotton 37inch. Hope to purchase another one soon. I purchased the Organic Lime green bean bag over 3 years ago. Well since then we have added a few more kiddos to the crew. I was so happy to return back to this webpage and find that I can purchase more of the filler and another bean bag that is exactly the same (lower chance of kids fighting over different style.) Thank you Ahh! Bean Bags! I bought the 37" organic bean bag with the organic liner and we decided to fill it with shredded latex. It is huge and so comfy even for an adult. I am going to buy another soon. We bought 2 organic 37" with virgin beads and a year later another 2 organic 37" with reground. The beads are more comfortable but did loose their fill after a year of use. We will order some refill and hopefully that brings us back to where we were. Our bag is brand new, but the workmanship, cotton, and our personalization details are all great and so far we are very pleased! We really loved the website - super, super informative about everything: sizing, materials, children with sensory deficiencies, etc. We had been researching bags for a while and ultimately chose an Ahh! bag because the website is geared toward consumer education and information rather than just advertising. I felt confident enough to order a personalized bag, which can't be returned because of the stitching, and it was a great choice! We needed something that would hold up to critters because our cats like to knead them. They think it's Mama! When my son isn't in it, the cat is. Washed well and doing great. We own 2 37" chairs with the organic cotton cover which are kept in our 10 year old son's play room. He and his friends enjoy sitting in them and playing video games. They are used every day. We have owned them for over a year and are very pleased with how they look and their sturdiness. We will be refilling one chair soon as it is getting a little flat. Definitely recommend these chairs. I bought the liner / bag empty and filled it with organic buckwheat hulls (used for pillows). I disagree with Ahh Products choice to put styrofoam / plastic foam inside an organic cotton liner, but they make an excellent cover. They love jumping into them, reading in them , watching movies in then you name it! Just wanted to let you know how happy we are with our ahh bean bags! We ordered the organic fabric almost two years ago and we love them. I am now ready to order some refill because they get used a lot. They wash well an I love that we can order refill and our bags will be like new again. Our whole family uses them especially our boys. They love jumping into them, reading in them , watching movies in then you name it! I bought bean bags for my sons over two years ago. They have been holding up great to rough treatment. I like the portability- they bring them from room to room depending on what is going on. The chairs are very comfortable. I got them in the same color with their names embroidered on them, so they wouldn't fight over whose chair was whose. The stitching on the embroidery turned out very nice. Held up, put through the ringer, since 2010 with 2 boys! Video games, tv, movies, etc. We are very happy with both of our bean bag chairs. We ordered our first one 2 years ago for our older son's 3rd birthday and it was a wonderful addition to his room. When our younger son turned 3 recently, he got one for his birthday and couldn't have been more excited. They both have very sensitive skin and have never been bothered by their chairs at all. WE have purchased several of your beanbag chairs for our oceanfront rental properties; the guests love them. I put several hours into researching the 'perfect bean bag'. I am glad to say that I found the perfect company and the perfect bean bag! I needed the bean bag to support my son's sensory needs while at the same time not overloading him with toxic chemicals and preservatives. Thank you!! They are so versatile! I use them to sit on, as footstool, an to stretch when I exercise! It's a beautiful stretch! I relax, meditate, they wonderful! I bought this bag for my 2 year old. I chose this size so that she is able to grow into it. One year later, she is still enjoying it. I was very happy to find a chair with an organic cover and warranty that could be picked up locally. My daughters were about 6 when we bought them in 2011, they love them and use them all the time! Great product would recommend to everyone! I planned to buy 3 chairs but bought one first to try it out and it seems great so far. Was a good size for my 5 year old and 8 year olds and I could get comfortable in it as well! Plan to buy two more chairs now! I am impressed with the environmentally friendly practices and products of this company. My bean bag is spacious, comfy, and durable--and no yucky chemical smells. Thanks for offering a better alternative! We purchased two of these organic bean bags just over a year ago and still love them and use them every day! They also still look like new. Kids and adults alike enjoy them. After 6 hours of autism therapy every weekday, my son loves to relax in his beanbag. I spent quite a bit of time researching before I decided on Ahhprods. The deciding factor was that it's not full of toxins like most other beanbag brands. My daughter's bean bag chair is her favorite seat to do homework or play guitar. We shopped around and found bean bag chairs that were loud when you shift in them, plastic/vinyl-sticks-to-skin, and smelly-with a plastic or chemical smell. This wonderful Ahh bean bag is fresh, soft and super-durable. It has had a lot of wear and looks new. This item blew out the Christmas budget last year but it has been worth every penny. I'm so happy with all that we DIDN'T get with this purchase! I am delighted that this bean bag chair is organic. 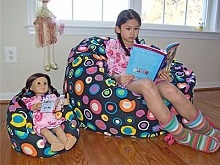 More importantly, the service was fabulous: we needed the bean bag for my daughter's birthday and they were wonderful about quickly shipping it. Wonderful -- stylish, fun without being cutesy, and comfy as all get out. I did a lot of comparison shopping, and have no doubt I made the right choice. I love this bean bag. My 8 year old and I fight over whose turn it is to sit in the bean bag when we read at night. It's bigger than I thought it would be, so do know that it takes up a great deal of space, but if you have the space for it, it's a phenomenal bean bag to have. I bought 2 of these organic bean bag chairs for grandsons...THEY love them, and so do I ! It is so much easier to play with them on the ground than sitting on a floor or using pillows to prop myself up. They are truly comfy and eco friendly to boot! Our son has high functioning autism and he loves your bean bag. He loves the way they feel. That's why we chose yours and have bought 2 more! Love your beanbags!! I'm getting ready to order our 3rd from you today!! My kids love them too!! These are very well made and comfy!! We looked everywhere for a quality bean bag with organic covering!! These bags are amazing!! 1 year old and a 4 year old...they love them and so do we!! Highly rec these opposed to pottery barn too!!! Both are a little flat about to get the refill...as these are great jumping bags too:)) Love them, only thing I would do is personalize next time!! My teen loves this bean bag chair. Super well made , nice fabric and it's just squishy enough to be comfortable but still supportive while sitting to read or do homework. The Made in USA factor was important to us as we were researching bean bag chairs too. Would definitely purchase one of these again! Love this Organic Bean Bag! Thanks for Everything, It's Great! I purchased a red organic cotton washable Large Bean Bag Chair from AHH Products for Christmas 2010 for our then kindergartner. As their website had detailed, after some time, countless hours of reading time and many jumps in to it, the bag needed additional stuffing. I ordered some and it arrived promptly. When I went to refill it and opened the cover zipper, some stuffing started to fall out all over. I called and told them I believed I had a defective liner. They said they'd be happy to replace it and do a partial refill if I would pay to ship it back. Upon the rep's advice, I shipped it back in the box the stuffing had come in for under $20. From there, AHH products did all this and more. They said they thought there was a catch with the cover zipper and so they replaced the cover, the liner, and did a partial refill before shipping it back to me ... ALL of this at NO CHARGE to me. Once I got it back to them, they had it back to me before I could even call to check and make sure it had arrived safely. Terrific product and very kind and helpful customer service folks. Why can't all companies do business like this... the old fashioned way? Our country would be in a lot better shape if it were true. Thanks, AHH! We have two of these bean bags and LOVE them! They are comfy bags to sit in. Our kids use them all the time for reading. Shipping was very fast, and the covers are excellent quality! I love that they're removable so you can wash them as needed - very nice! Being organic it a big plus for me. The material is soft not rough like some others I looked at. The bag as a whole is well made. The fact that it's water repellant is great. We LOVE these bean bags, the stuffing is excellent, and the bags are very comfortable to sit in. Size is great for kids play room too! I also love that it is eco-friendly! This is an excellent product that is of quality and organic! It is very stylish and comfortable. My kids love it, and I would definitely recommend this bean bag for any family. Eco-friendly, kid friendly, and stylish, too! Our four kids, from toddler to tween, LOVE our organic bean bag! The cover is so soft, making it the coziest seat in the house. And this parent appreciates the easy zip off washable cover and the waterproof lining. The 10 year warranty is pretty amazing, too! Thanks for offering an organic alternative. It was hard to find you but I'm glad I finally did. I was very happy to finally find an organic bean bag. These bean bags are not only super comfortable & stylish, they are eco-friendly as well.